For a day that was about preparation and anticipation, I got a lot of good bookish stuff done today. Read on, for books, fun librarians, many redheads, authors with fabulous hats, and a perplexing water bed on the roof of a bar. I met Sassymonkeyin person, which delights me! 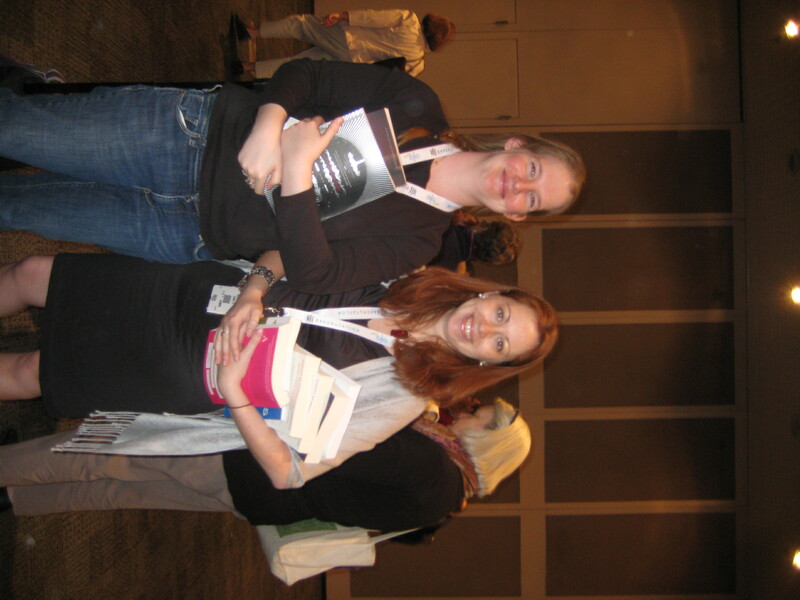 I’ve been reading her blog and chattering with her online for ages, and now I have actually met her. And taken a really goofy picture! And then there was an after-party at a really funky bar by the High Line, a place with all kinds of artful lighting and a roof deck. On that roof deck, there were seats that were like giant water beds. Spectacularly weird, but great. I imagine, though, that if you were, shall we say, sloshed, yourself, sitting on a sloshy giant water bed would be unnerving. I couldn’t tell how many of the fashionably dressed chattering people were Book Expo people, and how many were just there because they go to swanky and interesting bars on Monday night. So I was feeling a little scruffy with my bag on wheels. 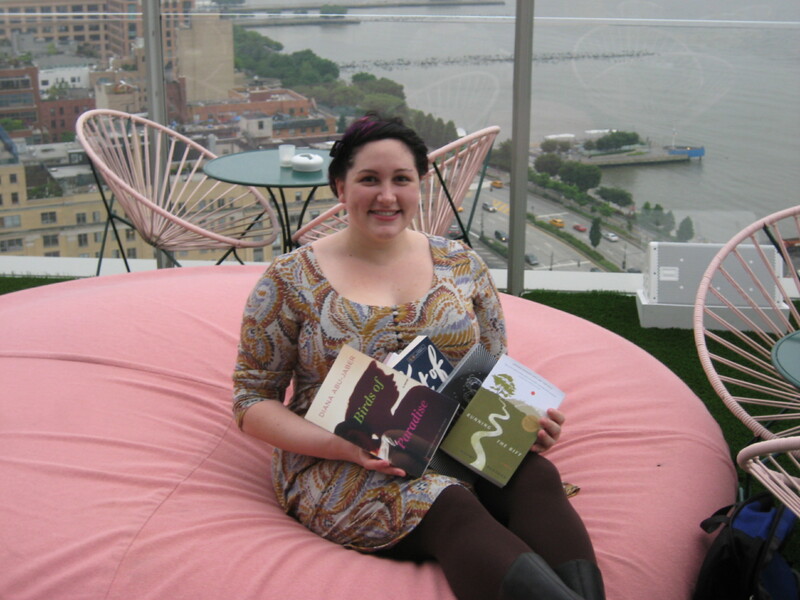 Hillary the Librarian, on the pink waterbed seat thing at the rooftop bar. 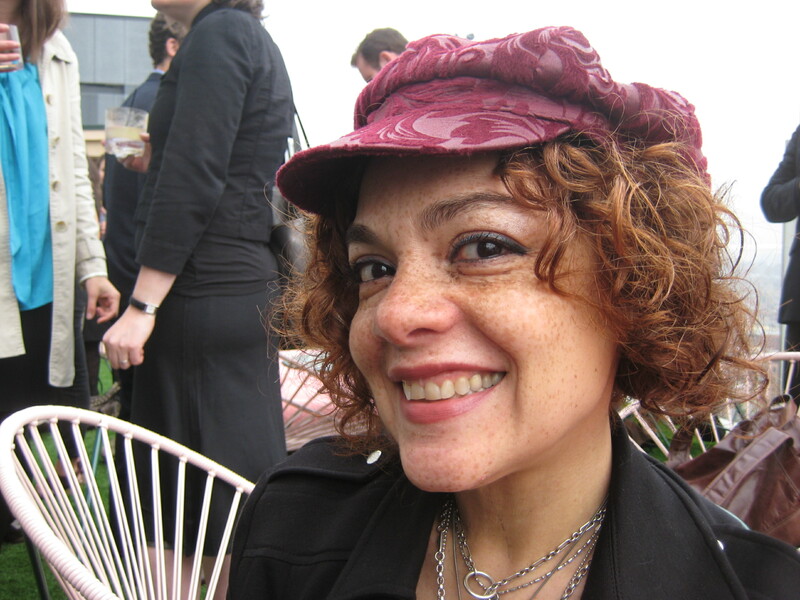 Michele Carlo, author of "Fish Out of Agua." Great hat, no? Meeting someone whose memoir you’ve read, feels a little voyeuristic. I’ve read all about her family, her teenage life, her marriage and divorce. And then, we’re chatting about hats and fashion and being cold on the roof deck. I felt a bit fangirly. I also felt a bit fangirly about finally getting to meet Sassymonkey in person. Sadly though, they have been retired for the season. What a difference in weather a week makes in NYC. Happy summer to you and hope we run into each other again soon!